Today, a long march for environmental justice is coming to an end. 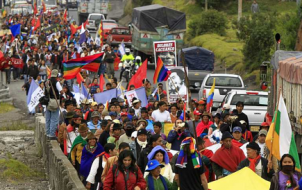 On March 8, hundreds of people started walking towards the Ecuadorian capital Quito and by the time they will arrive today they will be with thousands. After the government on March 5 signed a 1.4 billion $ deal with the Chinese mining company Ecuacorriente (ECSA) for an open-pit copper and other metals mine in their area, chances to have continued access to clean and drinkable water are very low. All the leaders of the Confederation of Indigenous Nationalities of Ecuador (CONAIE) ask for is the right to clean water and dignity. They could not have timed their arrival in Quito better than today, 22 March, when the world celebrates world water day. But after being applauded for his environmental pioneering on keeping oil in the ground (see the Yasuni project), President Rafael Correa is now all set to base the Ecuadorean economy on incomes from large scale mining. This decision is setting the government on a crash course with the indigenous people. The concerns for future environmental effects from copper mining in an open pit mine in the Amazonian province of Zamora Chinchipe are based on the track record of open-pit mining in Latin-America and in Ecuador so far. In Panama, Argentina, Guatemala, Peru and many other countries, large conflicts related to open-pit mining have recently drawn attention to the damages these projects usually leave behind. The current government in Peru only, which has gone very far down the road of large scale mining, already faced more than 100 socio-environmental conflicts , and counting. Governments across Latin America are facing a growing backlash to their resource-based growth plans. Struggles for environmental justice are rising fast across the continent. In Ecuador only, this report gives an overview of the many human rights abuses by the ever growing mining sector, which by April 2007 had extended concessions to an area of 2.8 million hectares, almost the size of Belgium. It focusses on Corriente Resources Inc., a Canadian mining company. Ecuacorriente is a local unit of Corriente Resources Inc. but at the end of 2009 this Canadian company was bought by the China Railway Construction Corporation. That is why it was the Chinese ambassador in Ecuador who is doing all he can to clean up the Chinese image and to minimize the environmental impact the mine will have. In an interview with El Pais, the Chinese ambassador to Ecuador, Yuan Guisen, said that “Chinese companies will do their utmost to minimize the negative impacts of mining activities on the environment”. Thanks so much for this! Can the “this” link that “gives an overview of the many human rights abuses by the ever growing mining sector” be updated? 🙂 Thanks!